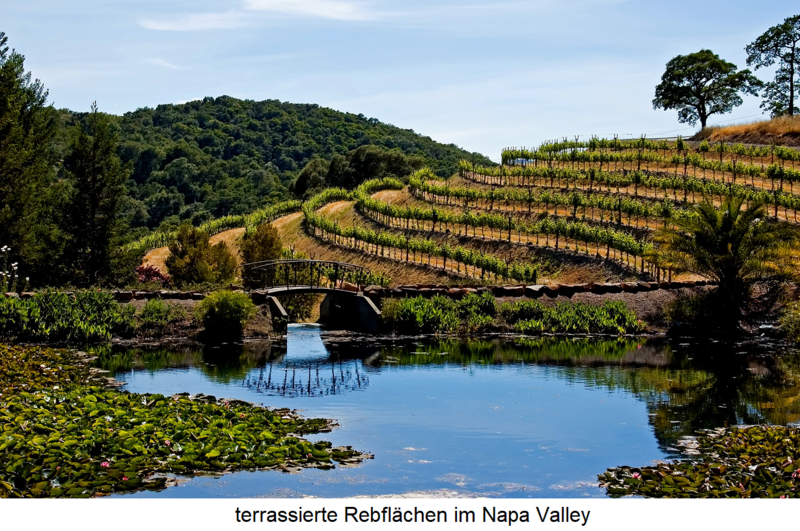 California can be considered as the motherland of viticulture in the United States describe. It is also quite rightly the beautiful epithet "Wine State", because wine is a significant economic factor here. The Spaniards led the Spanish variety in the 16th century Listán Prieto in Mexico one who was called here Misión and later in California mission. In 1769, the Franciscan monk had Junipero Serra (1713-1784) at the founding of the mission "San Diego" in California allegedly created the first vineyard with this vine (according to recent sources, only ten years later). Here there was not the great difficulties as on the east coast of the Atlantic, because the dry climate prevented fungal diseases and the vines thrived magnificently. The wines were then produced in a rather primitive way; a contemporary report provides clear information: Between two trees hung a cowhide filled with mashed grapes ( wineskin ), in which the fermentation took place. At the bottom was a stopper that was simply pulled out to fill a cup of wine. In most cases, the mission wine was burned to liquor and the Spriten of the residual wine used. Around the year 1833, a Frenchman with the emblematic name Jean-Louis planted Vignes (1780-1862) first imported from Europe vines near Los Angeles. General Mariano Vallejo (1808-1890) was the last Mexican Governor of California, which became independent from 1846 and four years later in 1850 the 31st US state. He had in Sonoma created a winery and was the first great wine maker. In 1849, gold fever broke out in California and wine broke out Zinfandel became the most popular drink of the gold diggers. The big breakthrough was made by the Hungarian Agoston Haraszthy (1812-1869) introduced from 1860, the Sonoma in the winery Buena Vista Winery founded and introduced hundreds of European grape varieties. In the immediate vicinity founded the German Jacob Gundlach a winery, 1973 under the name Gundlach-Bundschu was reactivated. Another pioneer was Charles, a native of Prussia jug (1825-1892), who in 1861 in St. Helena in Napa Valley the Charles Krug Winery founded and trained young winemakers. The native Frenchman Paul Masson (1859-1940) was famous from 1892 with its sparkling wine and referred to as "Champagne King of California". Until the end of the 19th century, a diverse wine culture developed with high-quality wines from imported European Vinifera varieties. Around 1880 was by the University of California a wine research center was founded in Berkeley, which later became Davis. In 1890, already one million hectoliters of wine was produced. The Phylloxera disaster From 1880 many vineyards were destroyed, but they were rebuilt. But the prohibition (1920-1933) brought the total decline of American wine culture. Only in the 1950s, a revolution began. It started with small wineries that experimented with Chardonnay and Pinot Noir and French oak barrels. The pioneers who were responsible for the recovery were Robert Mondavi (1913-2008), who founded his first winery in Oakville, Napa Valley in 1966, and Joe Heitz (1919-2000). Both were made by the famous oenologist André Tchelistcheff (1901-1994) supported. The high quality of Californian wines has also been enhanced by an already legendary wine tasting ( Paris Wine Tasting ) approved. Central Coast : The region covers about 25,000 hectares of vineyards. It forms a 560 km long strip from the north south of the San Francisco Bay to Los Angeles in the south. Central Valley (Delta & Inland): The vast region covers 140,000 hectares of vineyards for wine grapes, and another 80,000 hectares for the table grape and raisin production. Three quarters of California's wine comes from here. Sierra Foothills The region between the Central Valley and the Rocky Mountains was once very significant. Today, it covers only 2,100 hectares of vineyards. South Coast The less significant region is located between the two cities of Los Angeles in the north and San Diego on the Mexican border in the south. The vineyards extend over 1,000 kilometers along the coast of the Pacific. There are more different ones soil types as in all other famous wine regions in the world. Alone in just 50 kilometers long Napa Valley it is over 30. The most important wine-growing regions are on the same latitude as southern Spain and southern Italy. One of the variants for the naming is that the Spaniards the aptly named "Caliente Fornella", in German "hot stove" (as origin is also called a beautiful Amazon king named Califia, a fictional character of the Spaniard Montalvo). However, especially along the coast, the solar heat is significantly mitigated by the cool winds and fog of the Pacific. Between April and September there is little rainfall, so that in many vineyards an artificial irrigation must be done. The climates in California are very different, so that already in the 1930s, extensive analyzes were made. Comparable to Moselle. Burgundy. Loire and Champagne, Especially suitable for the varieties Chardonnay, Riesling, Pinot Noir and Sauvignon Blanc. 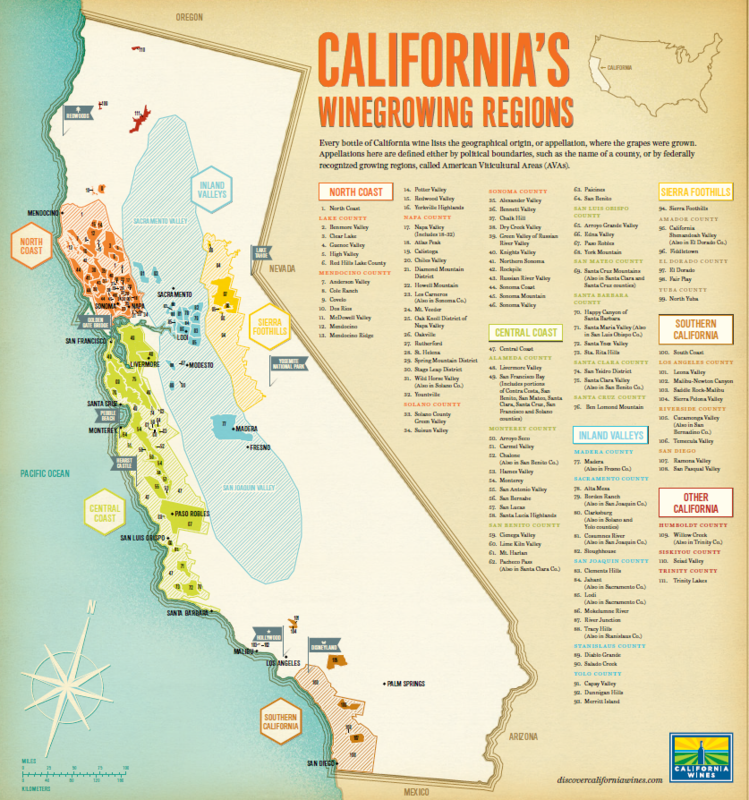 This includes z. Carneros and Mendocino (North Coast); Santa Clara, Santa Cruz and Monterey (Central Coast). Comparable to Bordeaux and Piedmont, Particularly suitable for the varieties Cabernet Sauvignon, Cabernet Franc, Merlot, Nebbiolo and Zinfandel. From here come the best dry wines. These include z. Southern Napa Valley and Sonoma (North Coast). Comparable to Rhone and Tuscany, Especially suitable for Grenache Noir (Garnacha Tinta), Sangiovese and Syrah. This includes z. The northern Napa Valley. Comparable with Central Spain, These include mostly the Central Valley and San Diego County (South Coast). Comparable to Greece and Tunisia, These include parts of the Central Valley. The wine law is quite simple and allows the producers a large margin. There are far fewer restrictions than in Europe. Among others are prohibited in the EU Vinification techniques such as Spinning Cone Column or the addition of aromatic Oak extracts and different flavorings allowed or allowed. The varietals (Varietal wines) account for most of the production. They must contain at least 75% of the specified grape variety. For cuvées is there the special Californian term Meritage, The Generics (Generic wines) bear a designation of origin. If a county is mentioned, 75% of the wine must come from there. When naming an AVA, it must be 85% and when mentioning a vineyard or location 95%. The previously widespread but incorrect use of European denominations of origin such as Burgundy, Chablis, Chianti, Sherry, Port and Rhine is now not due, at least for new wine brands, to the Wine Trade Agreement signed in December 2005 between the EU and the USA more permissible (see under the corresponding section in the keyword) wine law ). After the Second World War were of the University of California made extensive field trials, suitable rootstocks to find. In the early 1960s, Davis recommended the underlay AxR 1 (see in detail) to use in coastal areas, which also took place on a large scale. This turned out to be a big mistake, because this document was only moderately resistant to rain. The comeback of the phylloxera took place in the 1980s and caused huge damage in the California vineyards. This was a disaster on the one hand, but offered the opportunity to replace unwanted stocks. Seyval blanc White - ? In the middle of the 20th century, there were only 25 vineyards, today there are already well over 2,000, some of them very small farms. The 25 largest producers produce around 90% of the wine volume. Well-known producers are Abreu. Almaden Vineyards. Araujo. Beaulieu Vineyard. Beringer. Bronco Wine Company (with the brand Charles Shaw), Buena Vista Winery. Chalone Vineyard. Charles Krug Winery. Chateau Montelena. Clos du Bois. Clos Du Val Winery. Concannon. Dominus Estate. Fetzer. Francis Ford Coppola Winery. Freemark Abbey Winery. Gallo. Grgich Hills. Gundlach-Bundschu. Hanzell. Heitz. Inglenook Winery (formerly Niebaum-Coppola and Rubicon), Iron Horse. Jordan. Kendall-Jackson. Kenwood. Korbel. Krankl Manfred. Marimar Estate. Martha's Vineyard. Louis M. Martini. Paul Masson. Mayacamas Vineyards. Mondavi. Opus One. Joseph Phelps. Pine Ridge. Ridge Vineyards. Screaming Eagle. Sebastiani. Simi Winery. Spring Mountain Vineyard. Stag's Leap Wine Cellars. Sutter Home and Wine Group (Franzia). Others are listed in the sections (AVA's). This page was last modified at 17 April 2019 at 18:25.